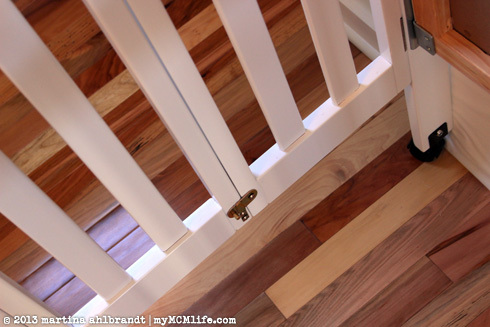 I was reluctant to buy a second crib when we prepared our home to foster again because I don’t think Ali would be using hers too much longer and I didn’t know if we’d get a call for a baby anyway. 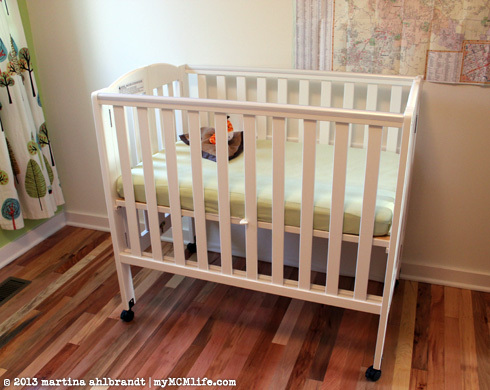 We got by with a pack-n-play for our home inspection but I wanted to get a real crib if/when we were placed with a baby. Enter Bee. 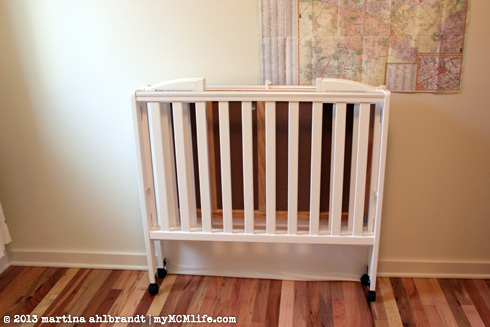 I had looked at these foldable cribs online before and decided to give this one a try. I’m really pleased with the design. 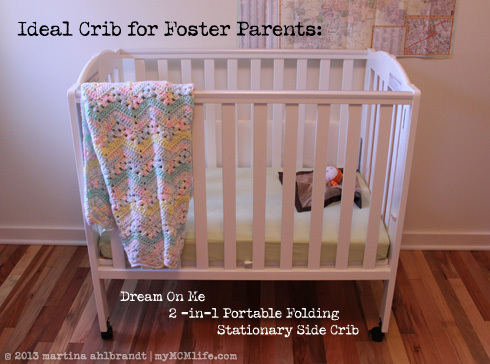 It seems ideal for foster parents or anyone else that might need to put up a crib in short notice and prefer one that stores in a small space when not in use. It has locking castors and folds up to about 6″ thick. It comes with a thin mattress, only about 1″ thick like a pack-n-play. 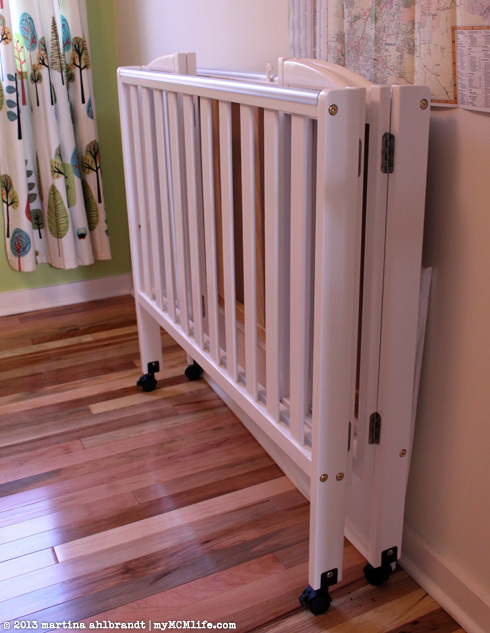 The sides lock open with latches on each side and the mattress board hinges down into place, either low or in a bassinet position. Bee is not sitting up or pulling up yet so we have it in the higher position. I followed the recommendations in the reviews and ordered the thicker 3″ mattress, as well as a waterproof mattress cover and a very soft cotton mini crib sheet. Fair Warning: The reviews for this are 2/3 positive and raving about the smart design; the other 1/3 is complaints about missing parts, cracked side rails, pieces looking like they’ve been chewed up by a rat, and poor/non-existant customer service from the manufacturer. Ours came in perfect condition and took me an hour or two to assemble. If you happen to get a bad one, I’d contact Amazon’s amazing customer service directly. One reviewer said Amazon sent a replacement immediately and sent money to return the damaged one. This entry was posted on Sunday, December 8th, 2013 at 4:40 pm and is filed under Art, Art: Bedoom for Foster Kids, Art: new home kids room, Family, Family: Foster Parenting. You can follow any responses to this entry through the RSS 2.0 feed. You can skip to the end and leave a response. Pinging is currently not allowed. Thanks for sharing. I have wondered what we would do if we were to get a call about a baby though I doubt we will going through Youth Villages, but I have thought about what we would do in this situation and that seems like a great solution and very affordable.